Putin@war: Russia hacked National Guard of Ukraine-website and posted a fake "Yarosh offensive article"
Russia hacked National Guard of Ukraine-website and posted a fake "Yarosh offensive article"
@DajeyPetros Ukrainian twitter account @Stopterrorua also hacked to place the same message. 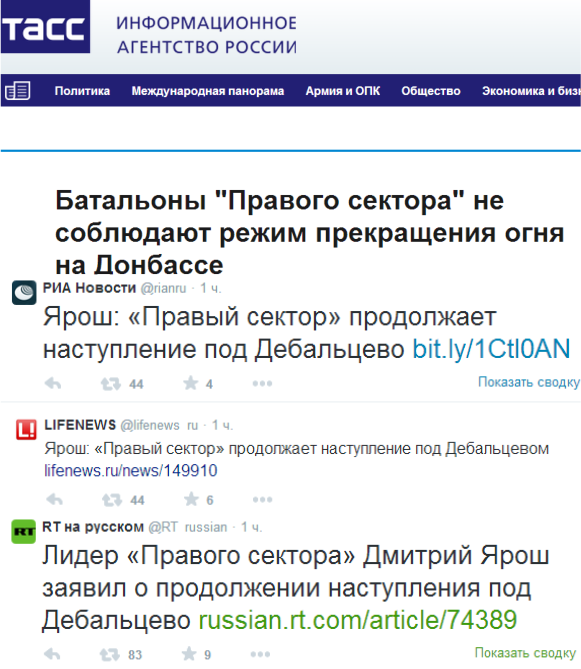 @DajeyPetros It has been already quoted by TASS, RIA, LifeNews and RT. Another prediction: in some Western media you will hear echoes of this false report! When you see one, let me know!!! Ceasefire across the ATO zone is adhered to. 9 out of 10 attacks came from uncontrolled Russian “Cossack” forces in 1 sector. Euromaidan also has a page about this. CLEARLY Russia wants to keep on fighting and is looking for an excuse to blame Ukraine for breaking the cease-fire. (Actually exactly the same as after Minsk I). Don't fall for this guys... You should be smarter than this!